Rocket rides, er, READS again. Rocket, that newly eager reader pup, is back with a helpful compendium of vocabulary words used in the earlier best-sellers on the joy of books and reading, Rocket's Mighty Words Schwartz & Wade, 2013). 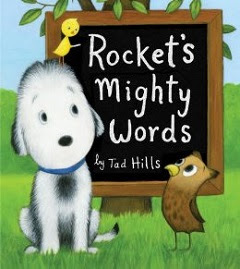 Not a stand-alone story, this book is an adjunct to the previous picture books starring that persistent pup, Rocket, and his persevering pedagogue, Little Yellow Bird, How Rocket Learned to Read and Rocket Writes a Story (see my reviews here), featuring Hills' fetching illustrations of a chalkboard filled with related words from Rocket's adventures. 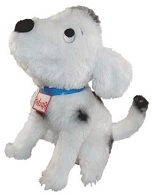 This new book joins the publisher's "boxed set" of the two books with a "Reading Tree" word aid, Rocket's Learning Box, and with a nod to kids who prefer plush pets to go with their reading lessons, the admittedly adorable How Rocket Learned to Read Doll, which adds to the fun and appeal of learning to read with Rocket. Emergent and beginning readers will welcome more of the encouraging example of Rocket, the dog who resisted and then embraced reading and writing.